I'm quite keen on the idea of creating an indoor observation hive with outside access through the wall using a short pipe or similar. 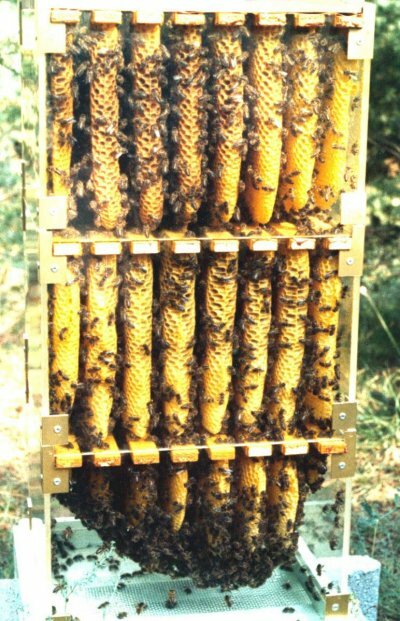 Would a mesh bottom on the hive give it adequate ventilation? I work with acrylic so was planning to make the hive from see through material. Yes, an open mesh bottom would be good. I'm almost ready to go with this, the mesh has been ordered today! My hive will be based on Phil's 36" topbar hive design and constructed totally out of clear see-through acrylic. I work with CNC routing and Laser cutting/engraving machines and acrylic is one of the materials we use most so the design and manufacture should be easy enough. I'm looking at installing two entrance tubes with a slight incline rising up towards the hive to prevent water ingress. Entrance tubes will be approximately a foot long (300mm) and will be through a South facing wall. The entrances will be entering the hive low down on the gable end, ideally they would have been the centre of one of the long sides as per Phil's design but the location does not easily lend itself to that layout. Floor will be open with Varroa mesh fitted and a further acrylic collection shelf below. The hive will be less than 3' from a large window which can be opened to allow bees to escape whenever the hive has to be opened but it is tucked far enough away that sunlight will not hit it directly. Anyone else see any pitfalls with this setup that I may have missed? aside from having bees flying around inside the house occasionally that is! Must confess I'm rather envious of your set up and access to machinery and materials to make the hive. Personally I prefer end entrances in my top bar hives rather than centre, so I don't see a problem there. Do you plan to put a roof on it or just have the top bars open to the room? Not sure there would be any draw back to that. The main concern that strikes me at the moment is that the room temperature will discourage the colony from clustering tight in winter which means that they will perhaps consume more stores and it may encourage early brooding which cannot be sustained by external forage/pollen, possibly resulting in brood being malnourished and or needing supplemental feeding. It may also have an impact on varroa levels as a result of having less/no winter brood break. I would also consider having a cover for the hive as I think the artificial light and activity in the house will cause additional confusion about the seasons/time of day and perhaps cause stress. That said, given the chance to do this myself, I would more than likely give it a go, especially as I don't have a TV. I did intend to mention that in the last post but forgot by the time I got to the end! Yes a top and side cover just to keep light out most of the time was my thinking, I know bees (and other insects) are attracted to artificial lighting, especially at night. I wasn't intending to use a roof, just the top bars as you mentioned. I was wondering about the entrances though, as they are longish tubes rather than just a standard entrance would the same 25mm inner diameter be sufficient or would the increased traffic maybe warrant a larger diameter or extra entrances? I'm going to take some pictures of the whole process and post them here so hopefully any obvious problems or mistakes that surface will show up. I'm picking the two sides up tomorrow as our laser cutting machine wasn't quite big enough to cut them. I've decided to go for a single entrance, I'm not sure whether to have it at the bottom of the top of the gable end yet so I've done one of each and will decide before it goes up. I've cut both ends, three follower boards and 30 top bars, my hive is only going to be 800mm long (almost 32") mainly due to the alcove its going to sit in, this still gives me a 52 litre hive space so I'm hoping it will be ok. The great thing with using acrylic and a laser cutter is that the dimensions are all exact, every topbar and follower board is an exact clone of each other. The mesh for the floor arrived a few weeks back so I really just need to assemble it and drill the hole in the wall, make up some end brackets to hold it on the wall and i'm good to go. I have a very small cluster of bees which i'm going to try in it, they swarmed very late last year and although it was a very small swarm i've managed to keep them fed and alive up till now in a small nuc box. Its only taken about 3 hours to cut everything on the machine and the material I used was just scrap stuff i'd been collecting, didn't cost me anything. The acrylic has film attached to protect it on either side, that why it looks white. I removed the film on one of the topbars and a follower board so you can see, its just clear acrylic, it looks just like glass. We had a couple of observation hives in our museum in a place thai I worked. One honey bee and one native bee. They just had 25mm tube through the wall, the honeybee had two tubes and the native bee one. they were both fine with this setup.